Usage and Dosage: Apply directly to the skin. Massage into skin until oil is completely absorbed. For external use only. This rare and unique oil found in Rose Hips Seeds are extracted from the seed of a wild rose called "Rosa Mosqueta". In clinical studies Rose Hip Oil was shown to be effective in cases of hypertrophic, hyperchronic and retractable scars remaining from surgery, traumas and burns. Aesthetically effective in reducing stretch mark after pregnancy and cosmetically effective in the control of age lines and wrinkles. People treated with the oil showed remarkable improvement in the quality of skin tissues. Age lines were significantly attenuated and new ones prevented. Amazing results have occurred when oil is massaged into the skin. The properties that make the rose hip seed oil an active product in tissue regeneration, can be used with a wide success in keeping texture and freshness of the skin, preventing the early ageing process and attenuating cars and spots. 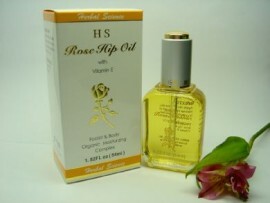 People treated with this oil got improvement in early wrinkles, hydration of dry skin and scars. The use of this pure oil or cream is made by a massage for 2 or 3 minutes to obtain a good penetration to deep layers of the skin, where the oil participates actively in tissue regeneration. This product has been triple-refined, which is very rare to see. The benefit is that, since it is so refined, no artifcial preservatives are required.